If the 19th Amendment to the Constitution has any disputed clauses in relation of its procedures, the President would commit himself to make necessary amendments to the areas which are politically muddled, following parliamentary procedures, the President's Media Division (PMD) said today. In a statement, the PMD said President Maithripala Sirisena would make sure these changes would ensure that the 19th Amendment's core and democratic values are preserved and it would be further strengthened. “The 19th Amendment was passed as a result of the irresistible courage and the leadership of President Sirisena in order to resolve problematic areas in Sri Lanka's democracy. The 19th Amendment paved the way for the establishment of independent commissions and to strengthen the structure of the democratic institutions. 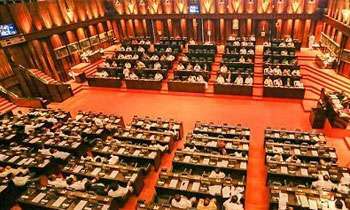 The amendment was a victory of the people who hail democracy and was also a requirement to take the country to a new era," the statement said. What’s he talking again? It’s our parliament that makes any changes to our constitution, isn’t it? He has really gone wonky. The Gamarala is wrong again. The 19th amendment can be revised in parliament with a 2/3 majority or with a referendum. It can be changed by one person. The most adorable solution is to abolish the executive presidency now. No sir you want to make changes cuz the 19th amendment is standing in your way! Shame on you! Only parliament have that power you can't? You have no authority to change constitution. You can be a party to it if you return to parliament once you are kicked out.